At its best, advertising is entertaining, even useful. At its worst, it is invasive, abrasive, and perhaps even offensive. 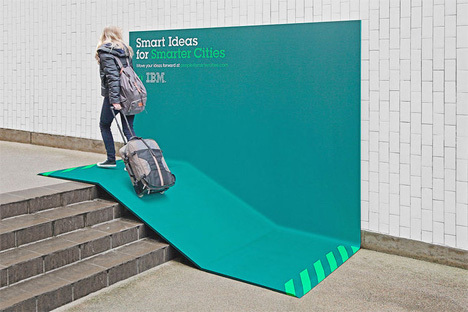 IBM’s new campaign from Ogilvy France skirts the line, featuring public objects that are useful but which somewhat invade the urban space. 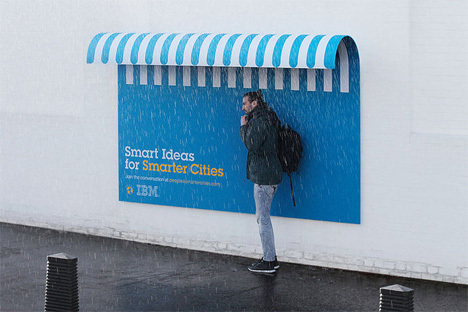 The Smart Ideas for Smarter Cities campaign includes three billboards that extend out from city walls and into the urban environment. One is an awning of sorts, providing a dry space for residents to get out of the rain or a bit of shade to get out of the sun. 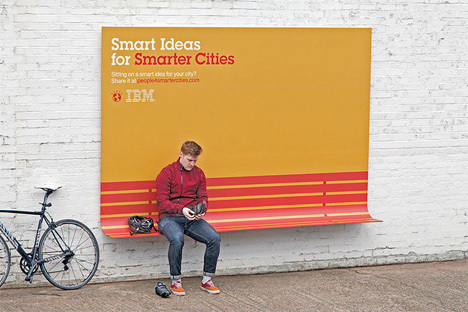 Another is a small bench which gives weary pedestrians the chance to sit down for a moment. The last is a ramp that covers a portion of a small staircase, letting cyclists or luggage-wheeling residents take an easier route. The campaign is meant to inspire viewers to think differently about their cities and how some elements could be tweaked to be more useful for residents. It’s something of a risk, however, since this invasion of the urban environment may not be welcomed by residents who think that advertising is already too ubiquitous on city streets.